Capcom has opened its official Capcom Tokyo Game Show 2017 portal website, and confirmed that Monster Hunter: World will be playable for the first time in Japan during the September exhibit. We are of course attending so stay tuned to find out how we like the game! 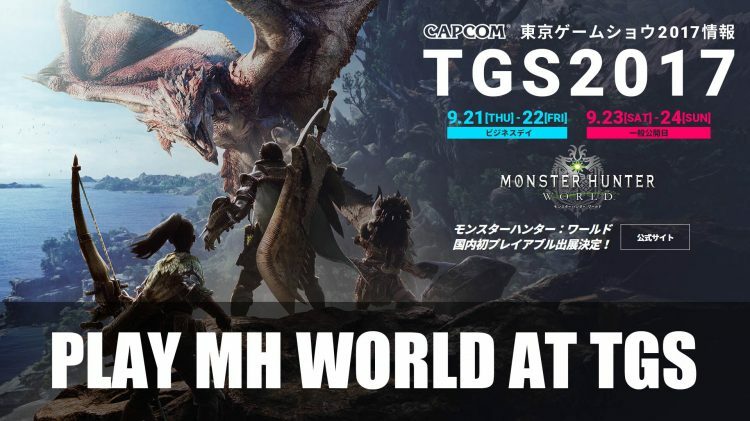 Monster Hunter: World First Demo at Tokyo Game Show 2017! Monster Hunter: World is due out worldwide for PlayStation 4 and Xbox One in early 2018. A PC release will follow later. In Japan, the game will only launch for PlayStation 4. The 2017 Tokyo Game Show will run from September 21 to 24, and 64 lucky users can go to Capcom’s site and register to attend the event for free. Fextralife is attending the business days, reserved for press, on the 21st and 22nd. Save the date! “Street Fighter V Shoryuken Tournament” on September 24 from 15:00 to 17:00 JST. Other titles from Capcom exhibiting at Tokyo Game Show 2017 will be announced at a later date. If you want to keep up with this title, watch a trailer with all Monster Hunter World Weapon Types. Check out this beautiful Monster Hunter World Gallery and our Monster Hunter World Preview. Or go straight to find some Monster Hunter World Gameplay on this trailer! For more RPG & Games news click me! I’ve never played a Monster Hunter Game before but this looks amazing, i can’t wait for release, not been this excited since the Bloodborne release countdown. You’re in for a treat! Multiplayer action, tactics preparation and strategy all meet on execution and builds. Endgame is sort of a huge grind sometimes but still epic.